We won this one in Minnesota when pound seizure was banned in April of 2012! We will continue to work to help other states end the practice of pound seizure, whereby animals in shelters can be claimed by licensed institutions for experimentation purposes. 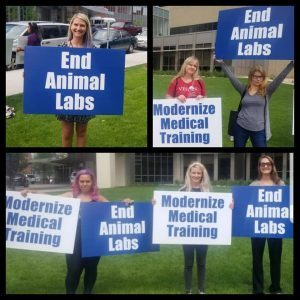 Last July we protested, once again, along with Physicians Committee for Responsible Medicine (PCRM), outside Hennepin County Medical Center, urging HCMC to stop their use of live animals in emergency medicine residency training. ARC staff helped PCRM deliver over 72,000 petitions to the Hennepin HealthCare board of directors after the demo. In a big victory for animals, Hennepin Healthcare, which operates HCMC in Minneapolis and trains residents from the University of Minnesota, recently announced that it had finally ended its use of live sheep and rabbits in invasive procedures (up to 150 rabbits and 150 sheep were used annually). PCRM has now filed a complaint with the USDA against the Mayo Clinic contending that Mayo is violating the federal Animal Welfare Act by operating a training program that includes surgery on live pigs. Mayo is one of only 15 programs in the country that continue to use live animals to train medical residents in emergency medicine. According to PCRM, most training programs have switched to simulators to educate new doctors in surgical techniques such as inserting breathing tubes or opening chest cavities. 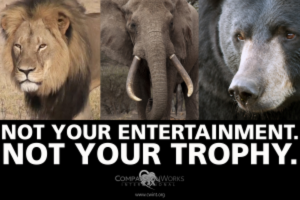 Join us to protest the archaic and cruel practice of trophy hunting at the Minnesota SCI World Hunting Expo on Saturday, February 23 from 10:00 A.M. – noon at the Minneapolis Marriott Northwest, 7025 Northland Drive N in Brooklyn Park. This year they’re going to be auctioning off items like a white rhino hunt and a leopard hunt. You can see all the animal killing being auctioned off here. My first year as ARC Program Director has been incredible and I’m grateful I was given this opportunity! To be able to reach so many people through so many avenues has been amazing. ARC has such a variety of events to help animals, whether we’re helping out at Chicken Run Rescue, having meaningful conversations with people about the benefits of plant-based eating at events like the Healthy Life Expo, talking about the environmental impact of animal agriculture at Sustainability Fairs, or using our virtual reality videos to give people a behind-the-scenes look at the lives of animals. We organized many protests to stand up for animals who are used for entertainment, experimentation, or clothing and it has been wonderful seeing so many new faces at these events. 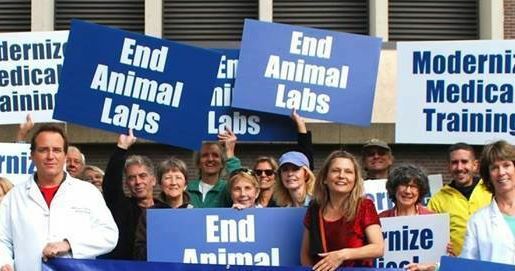 It’s always great hearing attendees say they were a bit apprehensive about protesting, but were pleasantly surprised by the peaceful way we conduct our demos, and how they feel empowered by getting a chance to take their passion for protecting animals to another level. Being able to bring people together and build on this community in Minnesota has been a very rewarding aspect of being with ARC. From our twice-a-month volunteer meetings to events like our Hot Dish Cook-Off and Turkey Free Friendsgiving, it’s exciting to see how many people are embracing a vegan lifestyle and I’m looking forward to what 2019 is going to bring. Thank you all for your support and for caring about animals! 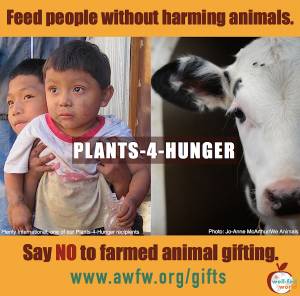 A Well-Fed World’s PLANTS-4-HUNGER program provides a more compassionate and nutritious gift-giving option, sending 100% of your gift to four hand-picked plant-based programs that feed people without using animals. The projects support school lunch programs in Ethiopia, provide non-GMO soybeans to farming families in Guatemala, deliver meals to those in need in India, and plant community food gardens in the U.S. 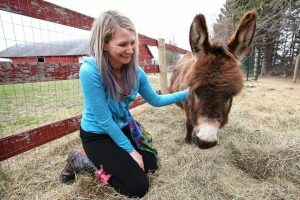 These programs provide both immediate assistance and long-term community solutions to improve food security and nutrition without harming animals. 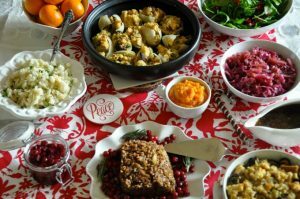 The food will be bountiful and delicious when you join ARC and friends for the 25th Annual Turkey Free Friendsgiving Potluck on Saturday 11/10. You do not have to be vegan or vegetarian to attend. Beverages will be provided, along with a variety of vegan cheeses to sample. Bring a vegan main dish, side dish, or dessert to share, along with a serving spoon (vegan = no meat, dairy, eggs, gelatin, honey, or refined sugar). Your dish should serve at least 10 people. Please bring a list of ingredients so we can be allergy-friendly. This is a wonderful event to bring your friends and family to and show them how delicious vegan holiday eating can be. We are looking forward to sharing a special meal with all of our friends, longtime and brand new. Location is Living Spirit United Methodist Church, 4501 Bloomington Ave. in Minneapolis from 5:00-7:00 p.m. Please RSVP either on Facebook or Meetup. Join us for a delicious time at the Sixth Annual Great Minnesota Hot Dish Competition – Vegan Brunch Edition! Original and creative brunch recipes from area cooks will be vying for two prize categories: Audience Favorite and Judge’s Choice. Support the Animal Rights Coalition’s work while tasting a variety of delicious brunch hot dishes for only $1 per sample. Free beverages will be provided and there will be lots of great door prizes. Join us on Saturday, September 1 from noon to 2 p.m. for a peaceful and legal protest of the exotic animal rides at the Minnesota Renaissance Festival at the Highway 169 entrance to the fair at 3525 145th Street West. Help educate the public about why they should skip these rides and instead enjoy the activities that don’t hurt animals. People who jump at the chance to get close to these animals by buying rides probably wouldn’t if they knew about the suffering the animals endure. The violence that goes into training animals used for rides is not seen by the public; elephants have to be made so frightened of the bull hook the handler carries that they will behave in front of spectators. In this photo from the 2017 MN Ren Fest, one of the elephants was begging for water; the handler poked her with his bull hook and gave her a Coke (Photo by Captured by Brooke Photography). This same company, Trunks and Humps, is being brought back to the fest in 2018. These animals are trucked around the country from site to site in small trailers or trucks. In the wild, they have extensive social networks and travel miles on foot every day. But when they’re sentenced to being living amusement park rides they plod in monotonous circles day after day with hundreds of pounds on their backs, for hour upon boring uncomfortable hour. 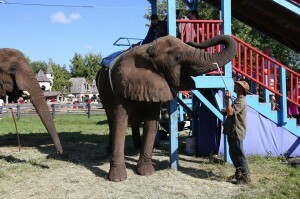 The Minnesota Renaissance Festival continues to feature these rides, despite their parent company having discontinued the elephant rides at its Kansas City Ren Fest. And this year they’re adding even more animal exploitation with an “Exotic Petting Zoo,” where fairgoers can hug a kangaroo, pet an African porcupine or hand feed a grape to a ring-tailed lemur. Join the Physicians Committee for Responsible Medicine (PCRM) and the Animal Rights Coalition in Minneapolis on Wednesday, July 25, to urge the Board of Directors of Hennepin Healthcare to end the use of live animals for training emergency medicine residents and department staff. Location: Please meet us on the sidewalk at the intersection of Chicago Avenue and 8th Street South in front of Hennepin Healthcare (GPS users, plug in this address: 799 S 8th St, Minneapolis, MN 55415). Signs will be provided. This event will be held rain or shine. Please use nearby public parking. At Hennepin, trainees are instructed to cut into live rabbits and sheep to practice invasive procedures. At the end of each session, the animals (up to 200 per year) are killed. Currently, 95 percent (216 of 228) of surveyed emergency medicine residency programs in the U.S. and Canada use only non-animal training methods, making this use of animals educationally substandard and inhumane. Even if you can’t make it to this demonstration, please take action and ask the hospital to end this educationally inferior and inhumane practice by making the switch to simulation—because Minnesota Deserves Better. We hope to see you at the demonstration! If you have any questions, feel free to contact Christine at CKauffman@pcrm.org.